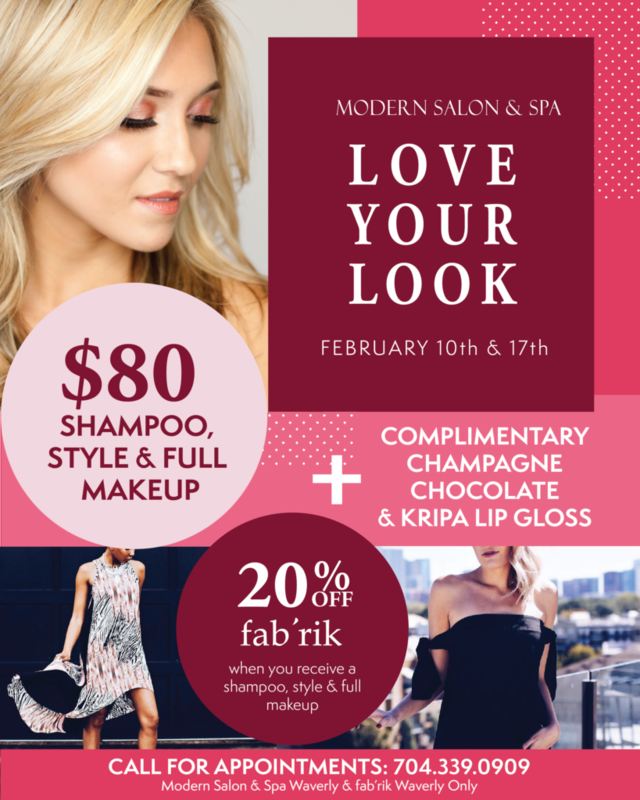 Join the team at Modern Salon & Spa for Love Your Look, February 10th & 17th. Guests will enjoy a shampoo, style & full makeup for $80, PLUS a complimentary glass of champagne and chocolates and a complimentary lip gloss to take home! On 2/10 & 2/17 fab’rik is offering 20% to Modern Salon & Spa guests who received these services – simply show your Modern receipt at checkout to get the discount at fab’rik! See additional details and let them know you’re interested by visiting the Modern Salon & Spa Facebook event page. ALSO – Modern Salon & Spa is running a Valentine’s Day special from Feb 1st – 14th. Guests who receive a hair AND makeup service will get a complimentary Kripa Lip Gloss!